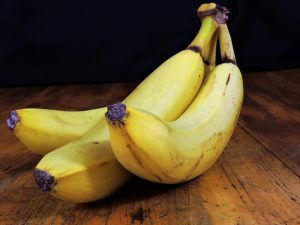 This has become my go-to recipe for using up bananas that have ripened too far. I keep a bag of peeled, ripened bananas in my freezer for this bread and smoothies. Beat together butter, apple sauce and sugar until fluffy. Add eggs one at a time. Add mashed bananas, milk, vanilla and cinnamon to butter mixture. In a separate bowl mix flour, baking powder, baking soda, and salt in a bowl. Add flour mixture to banana/butter mixture and stir until blended. Fold in chocolate chips until just combined. Pour batter in greased 9x5 loaf pan or muffin cups with liners. Loaf will take about 70 minutes and muffins about 15-20 minutes. Check with toothpick. Let cool 10 minutes before removing from pan and/or serving. Use a Zojirushi bread maker. Put the wet ingredients in first, followed by the dry ones (except chocolate chips). Set the machine to light crust "cake" setting. Add the chocolate chips when the bread machine beeps to add ingredients. Takes 2 hours to mix and bake a perfect loaf. Bonus: No need to heat the oven.